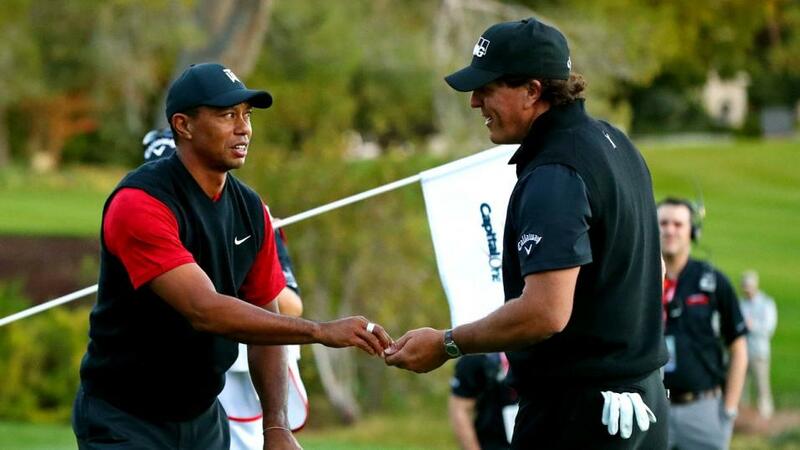 In chronological order, Phil Mickelson got the better of Tiger Woods in The Match on Friday night, Belgium won the World Cup of Golf by a comfortable three strokes in the early hours here in the UK yesterday and Wolverhampton's Aaron Rai won his first European Tour event in fine style at the Honma Hong Kong Open, before most Brits had opened the eyes on a chilly November morning. I had no interest in The Match financially and no intention to watch it either but I did see three or four holes on the back-nine before going to bed, having grown bored with it quite quickly, and I barely saw any of the World Cup of Golf either but for the record, Mickelson was the 7/4 second favourite and Belgium were well-backed 12/1 shots. I would have liked to have watched more of the World Cup, and the venue looked magnificent, but I just can't burn the candle at both ends without serious repercussions nowadays and it was bad enough following the Honma Hong Kong Open fairly closely. Even when I don't plan to do so, I can't help but have a sneaky look at the leaderboard in the middle of the night and combining the pockets of lost sleep there with the early starts to watch the event in earnest has resulted a tiring week. It may sound a bit bizarre given I backed the runner-up but I really enjoyed watching Rai win yesterday morning. He was calmness personified all week (won wire-to-wire) and especially so on the back-nine in round four. It was impossible not to admire greatly the manner in which he won. It couldn't have been easy playing with a pair of Ryder Cuppers in Tommy Fleetwood and Matthew Fitzpatrick and the latter threw everything bar the kitchen sink at Rai but he just didn't flinch. Rai began the final round with a commanding six-stroke lead and he started round four nicely enough with birdies at three and four to respond to Fitzpatrick's rapid start, who'd birdied the first two holes. Bogeys followed at six and eight for Rai and Fitzpatrick closed the gap to just two strokes with birdies at eight and ten but this was the moment when Rai really got going. That was the fourth day in-a-row that he'd birdied the par three 12th and he followed it with a two-putt birdie at the 13th. Fitzpatrick also birdied the reachable par five 13th and he also picked up shots on 14 and 16 to close the gap to just one. The vastly more experienced Fitzpatrick's price dipped to below [3.0] and close to the low of [2.5] that he'd been matched at on Saturday but the dramatic finale that looked on the cards failed to materialise when Fitzpatrick three-putted the 17th to give Rai the cushion he arguably deserved on the 72nd hole. Rai bogeyed the 18th and on paper, having a six-stroke lead reduced to just one might suggest he clung on to take his first European Tour title but that couldn't have been further from the truth. Fitzpatrick is a warrior in-contention and Rai faced up to him brilliantly. I didn't get involved in The Match at all, my sole selection in the World Cup, Mexico at [38.0], finished tied for second, and I drew a blank in Hong Kong. I've had better weeks but stakes have been modest and it's been far from a disaster. The biggest bet, by a wide margin, was on Matthew Fitzpatrick in-running and with hindsight, even though he got beat, the price taken, [6.4] at halfway, was very fair and he was arguably a bit unlucky to run in to such an impressive performer in Rai. Fitzpatrick finished just one behind Rai but five in front of the rest. The Honma Hong Kong Open is starting to become a bit of an outsider's event. Rai was the fourth winner in five years to be matched at a triple-figure price before the off. A solid [100.0] chance, he was matched a high of [110.0]. All the usual stats came to the fore and Hong Kong remains a course for the straight hitters. Rai only ranked 27th for Driving Accuracy but throughout contenders spoke of how missing a fairway often led to a bogey and the next four on the leaderboard ranked tenth, fourth, 27th and fifth. Finding the dancefloor was a gain key and the first five home ranked tied-seventh, 13th, fifth, tied-seventh and first for Greens In Regulation. Rai ranked sixth for Scrambling and that's arguably more in important that anything else given that nine of the last ten winners have now ranked inside the top-six for that stat and he also topped the Par 4 Scoring. In fact, he was the first player since 2002 to play the par fours in at least 10-under-par and 11 of the last 14 winners have now ranked no worse than fourth for that stat. So, stats wise, it's all very simple, forget about length and concentrate on the most accurate players but here's a lesson for every week that I definitely need to learn: do not let your opinion be swayed by one or two poor efforts when you've backed someone previously because that's exactly what I was guilty of last week with Rai! The 23-year-old won three times on the Challenge Tour in 2017 so he clearly knew how to get the job done but whenever I backed him, which was only occasionally, he performed poorly during his first season on the European Tour and I was chiefly put off him by one bad performance in particular. And the effects of that performance on my pocket quite clearly had an effect. Rai was a very obvious candidate looking at the stats before the off last week and that was also the case at the European Masters back in September. Crans clearly correlates well with Fanling (Fitzpatrick's won the last two editions for starters) and he stuck out like a sore thumb there, too, when I looked at the event before the off. In fact, I really liked his chances and on top of backing him to win the tournament, I loaded up on him to finish inside the top-ten at 6/1 and the top-20 at 3/1 so after he ended the opening day in a tie for 10th, after what was his first competitive round around the Swiss gem, hopes were high of a decent payday come Sunday. He missed the cut. That second round 74 in Switzerland had a bearing on my opinion of Rai both before the off last week and to a far lesser degree, in-running too, and to be quite frank, that's absolutely ridiculous. Anyway, looking forward to 2019, Rai has to be on the shortlist for Crans again given he'd also missed the cut on debut in Hong Kong last season and Fitzpatrick simply needs to go in to any staking plan at Hong Kong. Fanling suits his game so well it really is only a matter of time before he takes the title. There's plenty of golf to look forward to again this week with two events on the European Tout - the Australian PGA and the Mauritius Open and the Hero World Challenge on the PGA Tour. I'll be back later today or tomorrow with my previews.